When I first started researching spas throughout North America, I found that most of them let you come and go as you please, but not here. Honestly, it seemed silly to me, why not just take people’s money and let them do whatever they want? But then, the miracle happened: I woke up, on the fifth day, at 6:00 a.m. with a big smile on my face and “Good morning!” on my lips. At last, I was happy to rise before the sun filled with energy and optimism. In just five days I had become part of a new, intimate group of friends from around the country, and I was looking forward to seeing them on my morning hike. This enthusiasm and vitality that transformed me would not be present if I was at The Ranch for a mere day or two. On the fifth day I also had the rare opportunity to meet with Deborah, the 83 year old founder of Rancho La Puerta and the famed Golden Door Spa. She’s a busy woman and a powerhouse. In addition to overseeing The Ranch, she has been recognized by a bevy of associations for her stellar work in the community, U.S. government and around the world. Her curriculum vitae reads like a swashbuckling tale of achievements. She serves as a volunteer on the National Boards of The National Center, Washington, D.C.; Partners for Livable Places, D.C.; The Menninger Foundation and on the Board of Trustees for the California School of Professional Psychology. She founded COMBO, Combined Arts and Education Council of San Diego County, which has raised over $25 million to support 21 cultural organizations. She’s been the President and CEO of the Inter-American Foundation that supports the self-help efforts of the poor in Latin America and the Caribbean and has channeled over $110 million in U.S. taxpayer’s money directly to such organizations. That’s not including her published books and articles! Our conversation drifted between fascinating topics. We discussed her dedication to “Siempre Mejor” which means, “Always Better.” The Ranch is a clear result of this philosophy, and when you walk around, you can feel this dedication from the staff. We discussed her values and commitment to influencing positive change in individuals. She’s right, why don’t we make our scripts great? I personally believe the reason is because we don’t take the time for ourselves to write out what we want. We are always out to please others and leave ourselves at the bottom of the totem pole of life. Deborah believes that we all have the power to influence change and greatness, but we need to take time out of our frenetic lives to decipher what that greatness looks like. 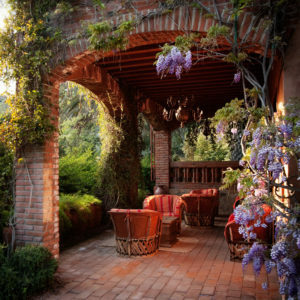 This is where Rancho La Puerta comes in. The Ranch is a sacred place where you can spend a week navigating through your life and deciding what you need to shed and what you need to focus on to make your script better. It worked for me. I showed up at The Ranch a ball of tension and anxiety. I had a book deadline looming in the near future and I was suffering from massive technology problems with my Apple. Going away for a whole week seemed a bit too much for me. But, even so, I did the unthinkable and escaped to The Rancho for seven glorious days. I need to relax and trust my instincts. I need to rest when I am tired, celebrate when I am happy, and always keep breathing. Would any of this be available if sixty five years ago Deborah and her husband Edmond decided to open up a retail store instead of one of the world’s best spas? Would I still be at home biting my nails and cussing at my computer? Probably. So, I thank Deborah for sharing her knowledge and remaining steadfast to her commitment to excellence. I think every women in the world needs to spend a week at The Ranch. If they did, I can assure you that this planet will be a more peaceful, happy place. For more information, go to their website, www.rancholapuerta.com.